Car trips with young children can be hazardous – to their health to their temper, and to your patience! Use our guide to make sure your child is safely buckled up and entertained for the whole journey. New laws were introduced in September 2006, making it compulsory to strap your children in to the right kind of seatbelts. It’s illegal to travel with a child on your lap or to strap a child seat into a passenger seat with an airbag. You must use the right type of restraint according to the age or weight of your child. Seat restraints are divided into four groups: Group 0 (for babies), Group 1 (9 months to 4 years), Group 2 (4 to 6 years) and Group 3 (from 6 years until big enough to use adult belt). If your child is heavier than average, he or she may require the next group up. 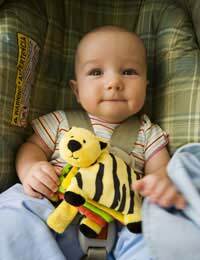 The law states that children weighing up to 15kgs must have a child seat with integral harness. After that stage, they are permitted to use a booster seat or cushion with the adult belt. Whatever type of seat you buy, check it is accredited to UN ECE 44.03 or a later standard. But what if your children won’t use a belt? If your child starts undoing his or her belt (as they’re prone to doing), you will need to explain its importance. Don’t terrify them but do describe some of the dangers of being in the car. If your child just hates getting into his or her car seat, help to make it more fun. You could involve them in helping to choose a new seat, or get them to give a name to their existing seat. For children who simply hate the car, prepare a fun routine to get them into the car. You could play a simple game of Simon Says as you get in: Simon Says put on your seatbelt, Simon Says wave out of the right window, and so on. For older children who are using booster seats, try to make them feel more ‘grown-up’. Explain that even race drivers and air pilots have to wear this kind of thing, and outline the dangers. Bring some sing-along or story tapes for the car. You could even record some yourself, substituting the characters’ names for your children’s names! Prepare cards for ‘Car Bingo’, with pictures of things like lorries in different colours, seagulls, cows, sheep, police cars, and bridges. You could even offer a prize for the first person to tick every box! For older children, you can buy cheap MP3 players with headphones. There are dozens of free podcasts online (try storynory.com), which you can download to keep them entertained. Heat from the sun can be magnified by a car window, and it’s possible to get sunburn through the window, too – glass doesn’t stop UV rays. On a sunny day, make sure your child is covered up, and apply child sun-cream to exposed areas. Take off their socks and shoes, and try to help them stay cool: pack plenty of cold drinks for everyone. You could also fix a sunscreen to the rear windows. Motion sickness is very common among children. Lengthy crying and general restlessness can be signs of this in younger children. If you think your children might suffer from motion sickness, book a GP appointment before you travel.